Tear-downs are always done in a spirit of learning and admiration. Having built some hobby electronics I really appreciate what goes into laying out a mixed signal PCB as well as one that has high and low-voltages on the same board and is subject to regulatory compliance both for electrical characteristics and RF emissions. I was handed some detailed WattWatchers images by a client and I did some mark-up of what goes into them based on previous experience of how energy monitors are put together. It is a 2-board design with an SMD PCI connector joining the boards. The PCI connector passes the power and current-voltage signal up to a vertical board. I shall call the bottom board power and sampling board and the side-board metering, CPU and network board. 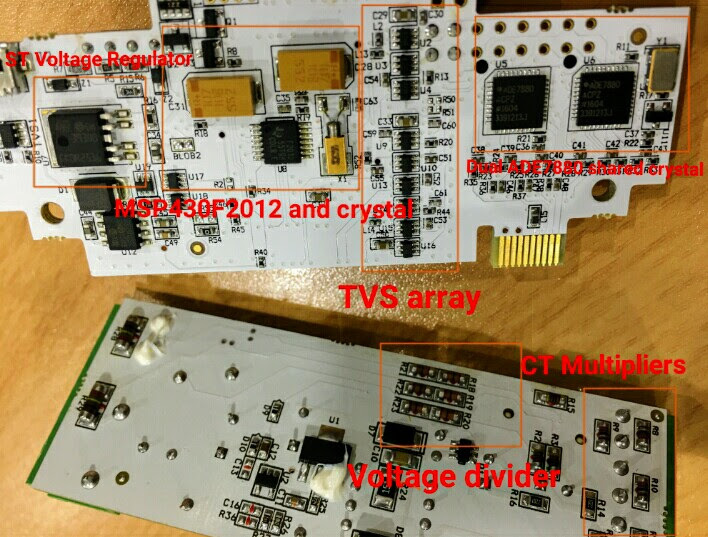 The first image below shows one side of both boards. The power supply board features a hefty cap-drop supply with assortment of fuses and TVS, as well as the aforementioned PCI connector. The vertical board features a large 3G module and associated Telstra sim slot, I assume the SIM is linked to a custom M2M plan which costs a few dollars a month. 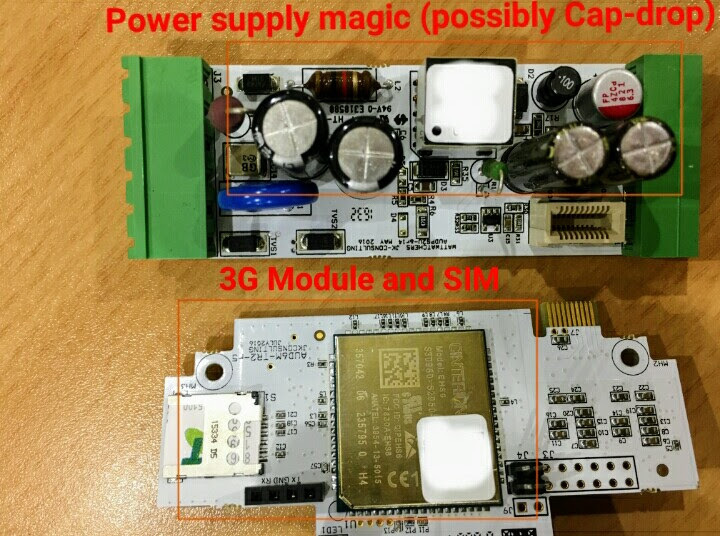 The other side of the vertical board features the most interesting goodies. On the left half it has a low-noise / high power voltage regulator from ST (presumably needed to feed the hungry 3G modules), as well as a low-power MSP430 MCU with a couple of large old-school tantalum caps. The right side of this board (separated by a row of what is most likely transient suppressors or isolation amplifiers) are a couple of Analog devices 3-phase energy monitor IC's. The isolation section indicates the presence of 9 analog channels which corresponds to 3-phases and 6-CT's. The 2 ADE7880's share a single clock crystal presumably buffered. There are also a bunch of passives to perform 50Hz filtering. The other side of the bottom board also featured in this image contains the voltage divider to sample the AC-phases and some current-multiplier/burden resistors to convert the current measured by the CT's into a voltage value. There is also another LDO on this board to presumably power one side of the isolation amplifiers, nothing too high power. This LDO must be at the end of the cap-drop system so the neutral or phase on it is at high voltage and generous dob of insulating snot is providing extra protection. The insulating snot can also be seen at the top-left corner of this board where the phase and neutral(?) or 2 phases are too close together for comfort/compliance. WattWatchers has done a great job packing a lot of features into an M2 DIN rail enclosure without resorting to many off the shelf modules and pre-built components except the 3G module. I am hoping to re-use some of the concepts here in my ATM90E36 based design.